For more information please call (215) 335-9367. 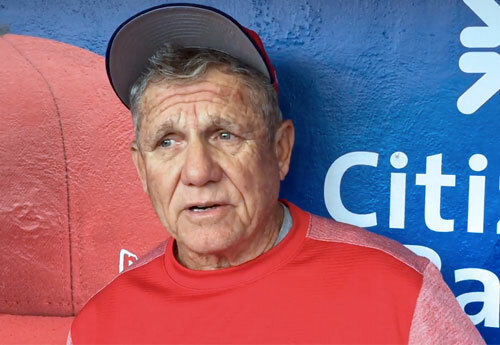 Larry Bowa is a former MLB shortstop, manager and coach as well as ESPN analyst. Bowa played for the Philadelphia Phillies from 1970–1981, the Chicago Cubs from 1982–1985 and the New York Mets in 1985. After his playing career, Bowa was a manager for the San Diego Padres and the Philadelphia Phillies plus he he coached for five major league teams. Bowa is a five-time All-Star for 1974–1976, 1978 and 1979 plus he is a World Series champion for 1980 as well as a two-time Gold Glove Award winner for 1972 and 1978. Sports Speakers 360 is a booking agent for pro athletes. If you would like to book Larry Bowa for a speaking engagement, appearance or endorsement, contact a Larry Bowa booking agent for fees at 1.855.303.5450.